Provide a safe and secure retreat for the anxious pet. This may be the bathroom tub, a cozy box in the closet, or a kennel covered with a blanket. Allow the pet to help choose his or her perfect place. Limit the pet's exposure to changes in light and sound. Owners may keep the safe room either dark or brightly lit so that flashes of lightning are not as noticeable. Music, fans, television, or other non - scary background noises can mask the noise of thunder or fireworks. NEVER punish the pet for behavior related to fears and anxiety as this will make matters worse!! Dogs look to their owners for guidance and assurance during scary times (instead of more stress). When your pet is stressed, try to remain composed and use a reassuring calm tone of voice. If the pet can recover from his or her fear without help, ignore the fearful behavior. Sometimes owners inadvertently reward fearful behavior by trying to excessively coddle the pet. Owners may change the significance of the scary event and reinforce calm behavior by initiating play and giving treats. If they are home, owners can make thunderstorm time a fun time. 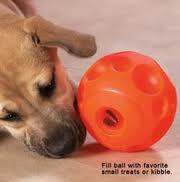 If they are not home, owners may leave the pet a puzzle type toy that has treats in it to keep the pet busy. Try desensitizing pets to scary sounds by playing storm soundtracks at low levels constantly. Soundtracks should be played daily at a low enough level that fear is not invoked. Every few days, the volume can be increased up to the natural level of the noise. If the pet becomes fearful, the volume should be lowered and the process started over and progress more slowly. If the pet still needs help recovering from fear, he or she needs some guidance on more positive activities to perform. Owners should give the dog commands to settle and relax, go to the safe place, or even take a leash walk inside the house. Pets may also benefit from massage or comfort wraps (such as the Thundershirt or Storm Defender). Contact your veterinarian for further tips or treatment options. Some pets benefit from medications if their anxiety is extreme or if they may hurt themselves in their panic. Please be aware that the tips listed above should still be used as medication alone is often not enough to solve anxiety issues. 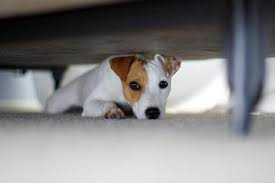 Scared pets should be allowed to hide wherever they feel safe. 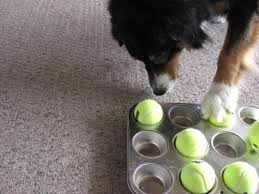 Food puzzles are designed to keep the pet busy and provide a positive experience during a scary situation. Food puzzles can be purchased or constructed at home. Thundershirt is an example of a snug fitting comfort wrap. These typically come with a money back guarantee. Click on the picture above to be taken to the Thundershirt website for more information. Storm Defender is an example of a comfort wrap with metallic threads to prevent electrostatic charge. Click on the picture above to be taken to the Storm Defender website for more information.